The UK Secretary of State for International Trade, the Right Honourable Liam Fox MP, announced today that Britain wanted its pavilion to be in the "Opportunity" themed district of Expo 2020 Dubai, saying that Dubai is on track to host an "incredible experience for millions". His Highness Sheikh Ahmed bin Saeed Al Maktoum, Chairman of the Expo 2020 Dubai Higher Committee, today welcomed Dr. Fox at His Highness’s office in Dubai. The visiting MP was briefed on the progress of Expo 2020 Dubai and plans for its legacy development, District 2020, which was unveiled last month at Cityscape Global 2017. 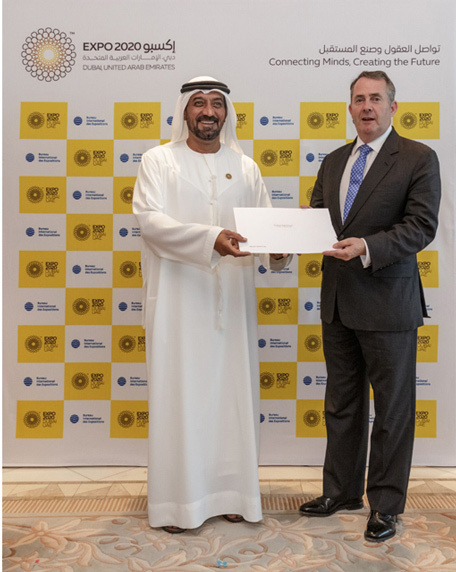 Dr. Fox reiterated the UK's support for Expo 2020 Dubai as he handed over the official letter of participation. He emphasised that a global, outward-looking country such as the UK could use Expo 2020 Dubai as a springboard for strengthening international trade and relations in a post-Brexit era outside of the European Union. Reem Al Hashimy, Minister of State for International Cooperation and Director General of Dubai Expo 2020 Bureau, was also present at the event during which Dr. Fox said the Opportunity thematic district would fit the UK’s aspirations from Expo perfectly, bringing new business opportunities and the chance to build new partnerships for his country. His Highness Sheikh Ahmed bin Saeed Al Maktoum said, "The UAE and the UK have very distinguished historical relations. The cooperation agreements between the two countries reflect the depth and strength of those relations, covering taxation, security, encouragement of investment, and aviation, among other areas." "Britain was one of the countries that first supported the efforts of the UAE for the honour of hosting Exp 2020 Dubai. We are grateful for their continuous backing that was stressed today by Dr. Fox. We look forward to more connection with the British institutions and companies that will join us in the journey to 2020 and beyond." Dr. Fox said: "I am delighted to visit Dubai as the UAE prepares for the new chapter in its exciting success story that will be boosted by Expo 2020 Dubai. The United Kingdom is also opening a new chapter in its history as we look to an economic future that grows in partnership with friends around the world. "We are excited about the incredible opportunities that Expo 2020 Dubai will open, and already is opening, for the outward-looking ‘Global Britain’ we are. Britain aims to be a leading advocate for free trade across the world and we look forward to developing this goal by connecting with nations, multilateral organisations and corporations in one of the most exciting locations on earth and the crossroads of East and West. "Today, I learned more about the latest plans for Expo 2020 Dubai and its legacy and heard about the great progress that is being made on construction of the site. Dubai is on track to host what will be an incredible and inspirational experience for millions of people from around the world." He added that the UK fully understands the potential of World Expos to be a platform for positive change since the concept originated in London with the Great Exhibition of the Works of Industry of all Nations of 1851. The UK has been a regular participant at World Expos over the past 166 years, including Expo Milano 2015, where the British national pavilion won 22 international awards. Over the history of Expos, the nation’s pavilions have demonstrated the best of British creativity and flair, such as the award-winning Hive in Milan, which was the UK’s top paid-for attraction in 2015 with 3.3 million visitors. It has now been erected in Kew Gardens, London. Not only was the UK one of the first nations to publicly support Dubai’s bid to host Expo 2020, it was also one of the first countries to publicly announce its official participation after the bid was won. British Prime Minister, the Right Honourable Theresa May MP, confirmed the UK would participate in December, when she met His Highness Sheikh Mohammed bin Rashid Al Maktoum, Vice President and Prime Minister of the UAE and Ruler of Dubai, on the margins of the annual meeting of leaders from the GCC in the Bahraini capital, Manama. The UK and the UAE have strong trade and investment links. About 6,000 UK businesses operate in the UAE and more than 100,000 British nationals live in the country. The UAE is the UK’s 12th largest trading partner, with volume reaching AED63 billion in bilateral trade in 2015. The UAE-UK Business Council has agreed an ambitious target of GBP25 billion (AED122 billion) of bilateral trade by 2020. In finance, UK firms represent 15 percent of the regulated financial firms in Dubai International Financial Centre. The City of London, the UK’s global financial centre, and Abu Dhabi have established close links and the Lord Mayor of the City of London makes annual visits to the UAE. Each year, more than a million British tourists visit the UAE and about 50,000 Emiratis visit the UK. There are about 170 direct flights each week between the UAE and the UK, operated by British Airways, Etihad Airways, and Emirates, among others. Expo 2020 Dubai will be a festival of human ingenuity around the theme of ‘Connecting Minds, Creating the Future’, built on the three pillars of Opportunity, Mobility and Sustainability. It will serve as a platform for international collaboration, fostering innovation and creating meaningful partnerships that will live far beyond 2020, not only for the UAE, but for the wider region and the world. Opening on 20th October 2020, Expo is projected to attract 25 million visitors, 70 percent of whom are expected to come from outside the UAE, the largest proportion of international visitors in the 166-year history of World Expos. More than 200 countries, companies, NGOs and educational institutions are also expected to participate.